The sun is always shining down on the farm. The busy farmer is driving around on his tractor making sure all his animals are happy and well fed. 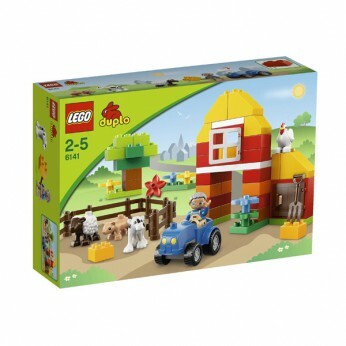 Includes 4 LEGO DUPLO animals and farmer DUPLO figure…. The sun is always shining down on the LEGO DUPLO My First Farm. The busy farmer is driving around on his tractor making sure his animals are all happy and well fed. Kids will love playing with this happy farmer and his animals. LEGO model number: 6141: Includes farmer DUPLO figure, a tractor and 4 animals. Features farm, tractor, pitchfork and assorted DUPLO bricks. The familiar animal theme helps children develop role play skills. For ages 2 years and over; EAN: 5702014837768. This toy costs approximately £19.99 (for the latest and best prices make sure you check our retailer list for the LEGO Duplo My First Farm 6141 above). In our review of LEGO Duplo My First Farm 6141 we classed it as being suitable for ages 6 years, 7 years, 8 years, 9 years, over 10 years but recommend you check the manufacturer specific advice before purchasing.